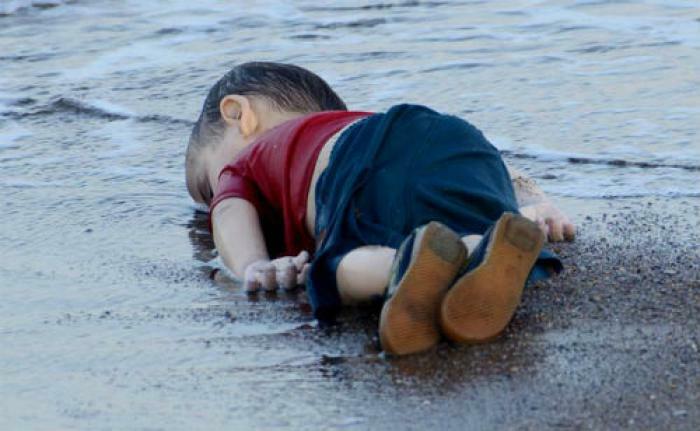 The heartbreaking photo of the little Syrian refugee boy washed up dead on the shore of Bodrum, Turkey (see picture: http://bit.ly/1PZHvDV) strikingly illustrates the tragic plight of desperate refugees – mostly Syrian – fleeing for their lives from the Islamic State and other violent groups in the Middle East and Africa. The 3-year-old boy, named Aylan, along with his 5-year-old brother, Galip, and their mother, Rehan, drowned after the raft carrying them capsized near the Turkish coast. Millions of refugees are scrambling to escape from the life-threatening civil wars plaguing several countries from Nigeria to Pakistan. According to the British newspaper The Independent, half of Syria’s population – approximately 11 million people – have been forced to flee; with four million living as refugees in foreign nations. And approximately 2.6 million Iraqis have been displaced, both due to civil wars and the barbarism of the Islamic State. Matt Wilch, United States Conference of Catholic Bishops refugee policy advisor for Migration and Refugee Service, told me that of the 4 million Syrian refugees, 1.8 million are being hosted by Turkey, Jordan has 1 million, Egypt has 200,000, tiny Lebanon is hosting over 1 million, and ironically even war-torn Iraq has opened its doors to 200,000 Syrians. But according to U.S. State Department figures, since March of 2011 – when the Syrian conflict started – only 1,554 Syrians have been admitted through the U.S. refugee resettlement program. This is shameful. Wealthy Europe and the U.S. have a moral obligation to offer far more help. Germany is providing an excellent example here. German Chancellor Angela Merkel, said that any Syrian arriving in Germany would be granted asylum. Wilch said if the U.S. and other wealthy nations would provide much more aid to Syria’s neighboring nations, not only would refugees be able to benefit from improved services, but most would not feel compelled to take the long dangerous journey to Europe. Wilch said only 37 percent of the needs of refugees are being funded in these neighboring host countries. According to the United Nations High Commissioner for Refugees, approximately 2,500 people have perished en route to Europe since the beginning of this year alone. The USCCB is urging Congress to increase the number of refugees allowed in the U.S. to 200,000 annually – 100,000 from Syria and 100,000 from other nations. Please contact your congressional delegation urging them to honor the bishops’ plea. And urge them to greatly increase aid to the Middle East nations hosting millions of refugees. The resources of these generous nations are stretched to the limit. Also, to be of further help please go to this link http://bit.ly/1LZxENG at the Jesuit Refugee Service/USA to easily submit (click submit twice) a letter to your senators and congressperson on behalf of our suffering refugee brothers and sisters. Magliano is a regular guest on Immaculate Heart Radio’s “Bay Area Catholic” magazine show and is an internationally syndicated social justice and peace columnist.